The NVidia GTX 1060 is a VR-ready graphics card that offers performance similar to the NVidia GTX 980, but at a lower price of $249 MSRP compared to the approximately $400 current street price of the GTX 980. The regular version of the GTX 1060 is available for preorder from retailers such as B&H Photo, however the GTX 1060 Founders Edition is now available direct from NVidia for $299 (see here). 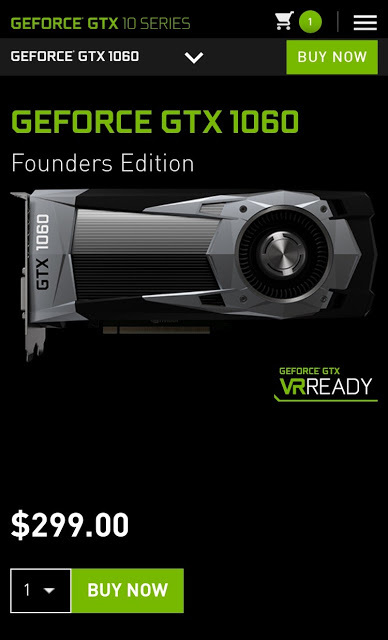 Compared to the regular version of the GTX 1060, the Founders Edition has premium construction and has cooling enhancements (see here – this one is for the GTX 1080 but the same enhancements are in the Founders Edition of the GTX 1060). Moreover, although the GTX 1060 has an MSRP of $249, the price of the regular GTX 1060 on B&H Photo is also $299, like the Founders Edition.